A local powercut launched a discussion about what would happen if I’d been machining something in the workshop whilst that happened. Well if it had been dark it might have been a little scary whilst all the equipment powered down but assuming I did not move into the path of the slowing equipment then I would be fine as long as I waited till it all stopped. However, it could be a different matter when it all starts up again. If I did not unplug or switch, when the power came back on it would start up again. There is however something that can be done about this. There is a clever little gadget called a no voltage release switch (NVR Switch) that turns off the switch when power is cut. I believe that many new tools contain one of these built in and it’s possible that my pillar drill and bench grinder (offhand grinder) do have one already. I’m fairly sure that the lathe does not as it is older. 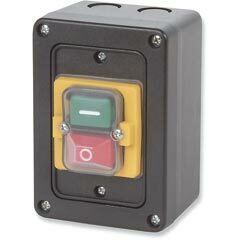 Some NVR switches also come with a built in safety switch and some even allow additional switches to be wired in to multiple safety switches or a remote control facility. These are also known as “Undervoltage triggers” in some parts of the world. So far, the following suppliers have been found that provide NVRs that can either be mounted on the wall or are in the form of an extention cable and hence could be used with the lathe. I’ve also seen NVRs on ebay that could be wired internally to some equipment. I would be interested to know if there are others, particularly if it’s possible to get a smaller (or perhaps just flatter) device that I could mount inside my mini lathe. A related device is the safety interlock switch which is the thing that turns off the power when you open the case of your machinery, it stops you sticking your fingers into the spinning wheels of the drill’s gearbox for example. It’s might be a good idea for me to have one of these on the lathe too. See also Still no voltage article.